Description: Lillia has never had any problems dealing with boys who like her. Not until this summer, when one went too far. No way will she let the same thing happen to her little sister. Kat is tired of the rumours, the insults, the cruel jokes. It all goes back to one person– her ex-best friend– and she's ready to make her pay. Burn for Burn is a soapy drama about revenge and righting apparent wrongs. Three different empowered girls join forces to extract acts of revenge on those that have wronged them. 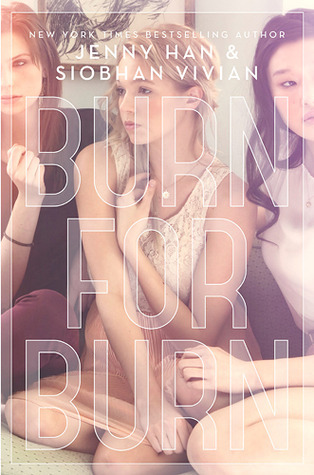 With added suspense and tension, Burn for Burn contains the usual teenage tropes. The popular rich girl, bitchy head cheerleader, insufferable jock, tomboy and shy girl all play primary roles in this dynamic story about righting wrongs. Set on a small island, Burn for Burn is a quick read with plenty of drama, betrayal and brutal consequences. Mary, Lillia, and Kat are very different and distinctive characters. Each character had a very unique defined voice. Mary returns to Jar Island as a way to prove that the past is behind her, and that she is ready to move forward. She was a very shy and reserved character, whom we learn more about as her rough childhood is exposed. Lillia is the popular girl at school, rich, beautiful and always in the spotlight. After an experience changes her, all she wants to do is protect her little sister. Kat is the rebel. She’s a tomboy, with a love of music and a strong need to escape from the island. Kat’s angry with her former best friend Rennie who dumped her for better prospects. Due to all the betrayal Mary, Lillia and Kat endure; they decide to join forces to punish those who have caused them pain. The acts of revenge themselves varied. They started as mild pranks intended to embarrass the target. As the story progresses, the girls became bolder, took bigger risks and the acts escalated into criminal territory with significant consequences. There were flashbacks that showcased the motivations and justifications behind Mary, Kat and Lillia revenge plans. They provided insight into who these characters were and what events had shaped them to act in such a manner. The theme of friendship was strong in this book. Various friendships start to unravel due to the pact these girls make. Due to the nature of what they were doing, the girls also develop a strong bond. The great aspect of this book was its soapy nature. This was what I would describe as a train wreck sort of a book. From the minute you start reading you know that these plans are going to backfire and lead to major consequences. But you cannot but help keep reading, waiting for the eventual crash. In the end the acts of revenge hold some immense consequences for all of the girls. It will be interesting to see how they will deal with the guilt and consequences of their actions in the sequel. There was a small supernatural twist in this book that came completely out of left field. It threw me off guard because I thought this was a contemporary story. It was very small and something you could easily miss. I wasn’t such a fan of its inclusion as it’s just mentioned and not explained. Hopefully it will be explored in further books. Burn for Burn is a quick soapy drama filled story that is sure to captivate.